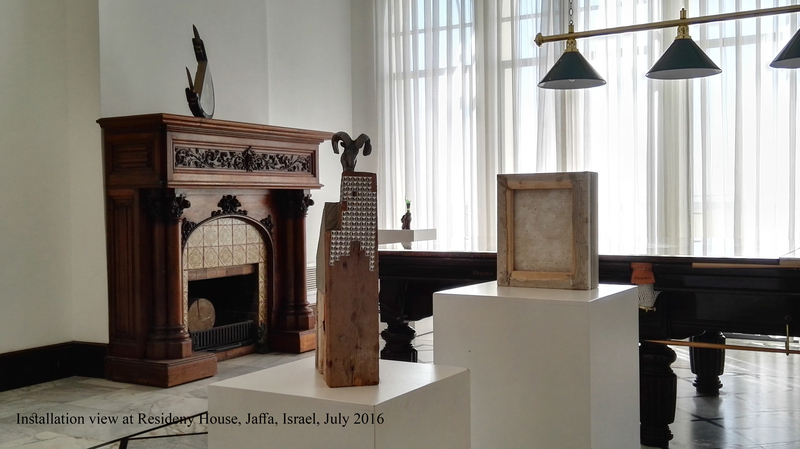 After more than two months in our residency house in Jaffa, Mexican artist Moris' (Israel Moreno) residency has come to an end. 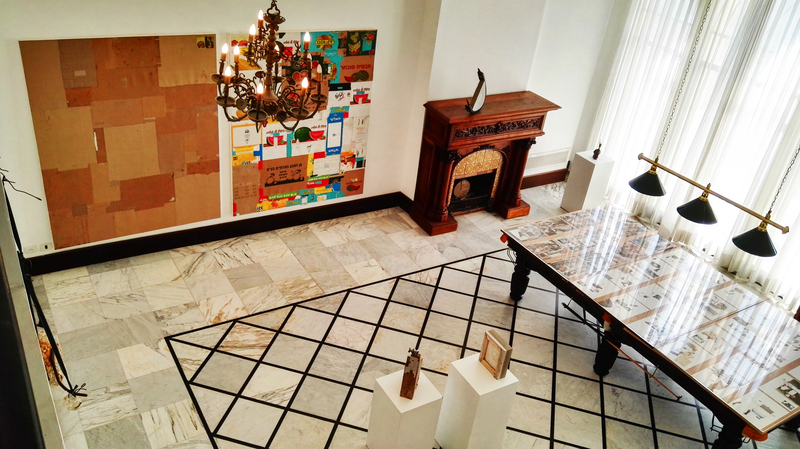 To showcase the artworks he produced during his stay, he presented his installations and collages in a grand exhibition in the residency house itself. The exhibition displayed the creative process Moris underwent during his time in Israel. Collecting discarded objects he found on the street or the beach, picking up old paintings from the flea market in Jaffa and cutting out eye-catching snippets from the newspaper on a daily basis manifested into a striking constellation of larger-than-life artworks. 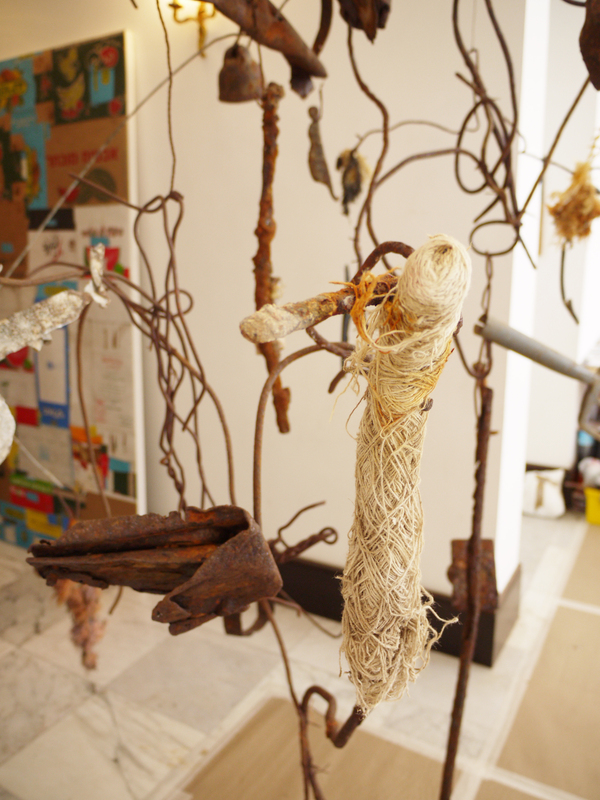 At the entrance of the impressive and spacious residency house hangs a giant mobile, "Nothing Grows Accordingly", made from rusted metal objects rejected by the sea. The piece, whose title also names the exhibition, sets the tone of the entire display – the rust and decay of the objects gives life to the material, like a breathing and growing reef at the bottom of the sea. In the main hall, the rest of the works were placed on pedestals or hung on the walls, each of them "alive" in their own way. "Dogs Trying to Kill Us", a ready-made sculpture acquired by START, made out of rubber, concrete, rope and knives, was positioned on its rounded base, so it stood at an angle. 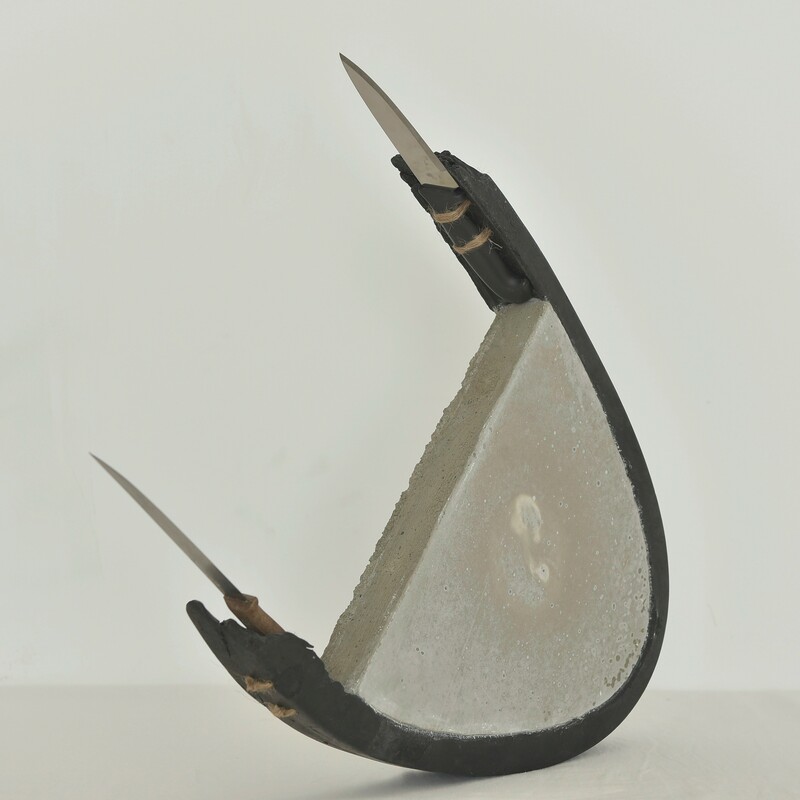 This created an internal tension in the work, between its own physicality and the force of gravity, a tension that channeled into the two knives at either end, jutting out like concordes slicing through the sky. Although completely immobile, the work contains a violent dynamism that keeps the viewer on edge. 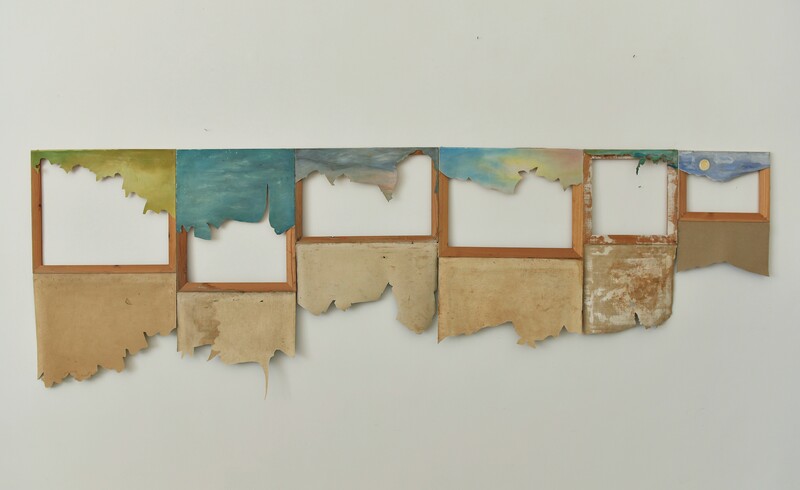 "Broken Sky 16", also acquired by START, is a decorative wall piece created from old oil-paintings Moris selected from the nearby Jaffa flea market. To recreate the old "amateur" paintings, he tore them and stapled their frames together. Destroying the paintings was actually Moris' way to re-incarnate them into new works of art and keep them from perishing. The result was a beautiful wall-hanging of a dreamy sky, fading into the vacant spaces with an air of melancholy. The work is also a subtle commentary on the mechanics of the art market and how “value” is created of thin air. We opened the exhibition on the eve of July 28th, and all who attended were awe struck by the direct and piercing pieces. The exhibition was a continuation of Moris' career-long discussion with violence, but this time his works explored the concept from within the Middle Eastern context. The pieces extracted from the sea originate from a problematic habitat of territorial waters, and knives that jut out from several pieces are saturated with a sense of nationalism and terror, in contrast to his previous works made in Mexico, that dealt with the criminal violence of gangs and theft. Without a doubt, his new works are an interesting and thought-provoking addition to his already-impressive body of work. Beyond the unique personal experience, participation in the residency was for Moris a stepping-stone in his artistic career. Firstly, the residency provided exposure of his work and repertoire to new audiences. Second, through the program Moris obtained press coverage and visibility via the Tiroche DeLeon and ST-ART websites and social media. And finally, the exhibition gave Moris the space and opportunity to see his artistic vision come to life and present it to the public. For more about Moris' residency, watch our interview.